Recently purchased or thinking about getting a trampoline? Step-up the safety and stay in control with Vuly's sturdy trampoline ladder. Professional trampoline ladders are designed to make accessing your tramp a breeze. For younger users specifically, this product is a must. It has come to our attention that some current trampoline owners are using substitute objects, such as boxes, to help children gain easy access to their trampoline. This news is very concerning as using unverified alternatives to professional ladders places your child at risk. These objects are unstable and are potentially very dangerous, dramatically increasing the chance of injury. Even seemingly reliable alternatives, such as small stepladders, can pose a threat to children's safety as they are not specially made for your trampoline. Professional trampoline ladders are designed specifically to hook securely onto the trampoline frame underneath the safety padding. Being steady and reliable, a professional ladder will ensure your child mounts the trampoline in a safe and easy way. This method of attachment, with no bolts or screws, and the lightness of the product allows professional ladders to be used as an effective form of usage control. If you have young children and worry about possible unsupervised usage of the trampoline, a simple solution is to remove the ladder. For an extra precaution place a small padlock on the zipper. 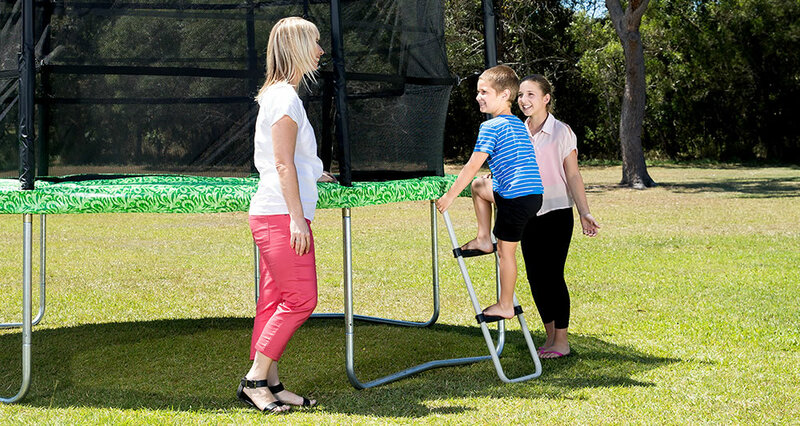 The Australian trampoline market hosts several styles of trampoline ladders at varying qualities and safety standards. Vuly's ladders come branded with our logo, assuring customers of the reliability of our specially designed product. Our ladders are composed of a sealed steel frame complete with two large platform steps. Unlike most other ladders on the market, these wide steps come with a unique non-slip grip for extra safety. The unique drainage holes will ensure that even in wet weather your child is safe. All ladders hold a maximum 100kg, making them suitable for users of all available trampoline sizes. When it comes to trampolining, safety always comes first. A ladder-less trampoline is a disaster waiting to happen. So throw out that box, put away the step ladder, stop worrying about unsupervised usage, and invest in a trampoline ladder today.